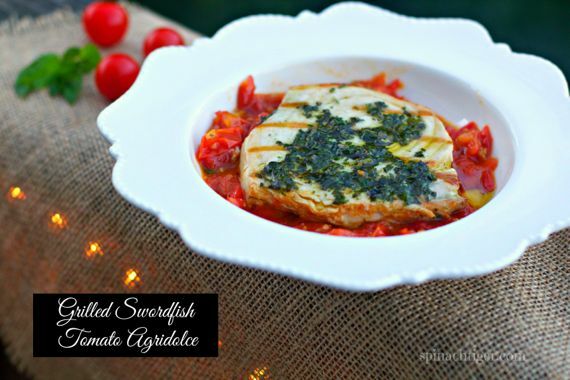 Grilled Swordfish Verde with Tomato Agridolce is a big fat healthy dish that will tickle your taste buds with heat from tabasco and brightness from the sweet and sour agridolce. Tabasco is the iconic hot sauce that everyone knows about, and it’s not too hard to figure out ways to use it. It brings tang, heat and brightness to a dish. You’ll love how healthy, quick and easy this dish is. The dense texture of the swordfish is brightened by the salsa verde and boosted with texture and flavor by the spicy agridolce. It all combines to deliver one good bite of food. This was originally created for aa most exciting challenge, because the rules of the challenge were to create five recipes using any combination of the following ten ingredients along with Tabasco sauce. We couldn’t use any other ingredients. The herbs were basil, cilantro and mint. Any two of these herbs equaled one ingredient. Grilled Swordfish Dish is an easy fast dinner, made in under 30 minutes. This grilled swordfish over tomato agridolce topped with salsa verde was actually the last dish I made for this series and was made in under 30 minutes. This is the healthiest of my five dishes, paleo friendly, as there are no grains, no sugar. I used maple syrup for the sweetness in the sweet and sour sauce. What is Tabasco Sauce? It’s made in the United States, by the Mc.Ilhenny Company, in Avery Island, Louisiana and was established in 1868. It’s very simple. It’s vinegar, red pepper and salt. The key is the balance of acid and heat. What does Tabasco Sauce do for a recipe? It wakes it up, brings acid, salt and heat. It can excite bland food or add an extra layer of flavor. 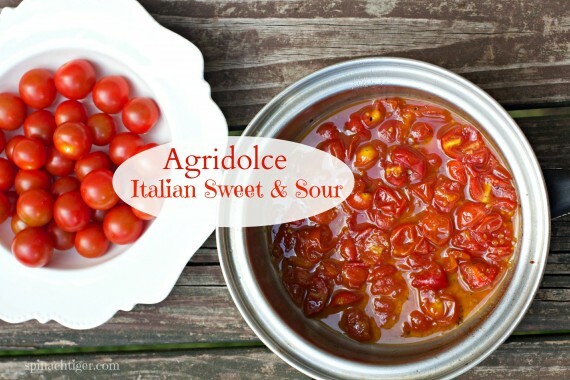 What is Agridolce? It’s an Italian sweet and sour sauce which typically uses onions, sugar and vinegar . Staying within the boundaries of the challenge, I only used vinegar, maple syrup, cherry tomatoes and Tabasco, and it was everything it needed to be. 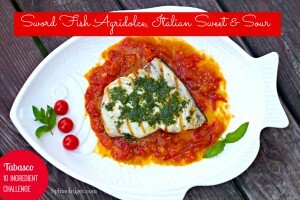 The agridolce is great with swordfish, which is a dense steak-like fish. Each bite is almost like a tangy stew, enhanced by the salsa verde on top. I ate every bite and relished in how healthy and filling this dish was. By Friday, I will have used at least 9 of the ingredients, including a very unique dessert. Get your hot sauce on, and stay tuned. Grilled Swordfish with basil and mint sauce served agridolce, sweet and sour Italian. Rub sword fish with olive oil, season with salt and pepper. Place on hot grill and grill until cooked through, 5 minutes on one side, 3 minutes on second side. In blender or mini food processor pulse herbs, olive oil, salt, pepper, Tabasco Sauce until a puree is formed. Heat in a small sauce pan, olive oil, maple syrup and 1 teaspoon Tabasco sauce. Add tomatoes, vinegar, salt, pepper. Cook down for about 15 to 20 minutes. Sauce will be bright, tangy, sweet and sour. Add in more Tabasco Sauce to the heat level you desire. Mix well. Place swordfish over the agridolce sauce. Top the swordfish with sauce verde. Beautiful job showing the ingredients Angela. I like how this looks. The recipe is pretty scrumptious as well. A scrumptious and healthy summer dish! Wonderful.